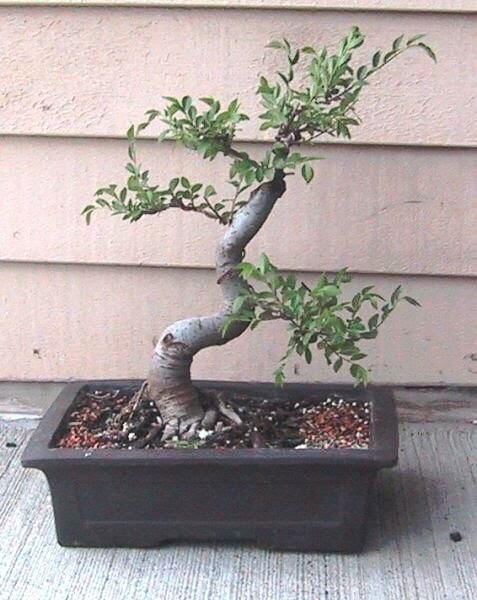 Spring pruning is done, so the next thing I'd like to do is repot this into a bonsai pot. Click any picture for a larger version. 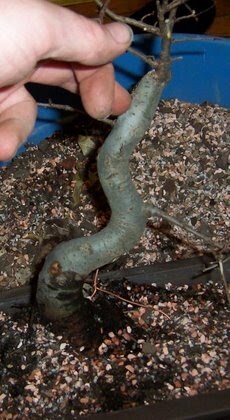 The best time to repot elms (and most deciduous trees) is just as the buds swell in the spring, but before they break. 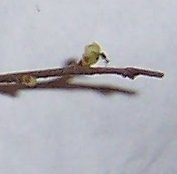 This is a picture of a swollen bud. Notice the green. This is a bud that has broken. You can't see it well because this is a bad picture, but there are actually tiny little leaves. 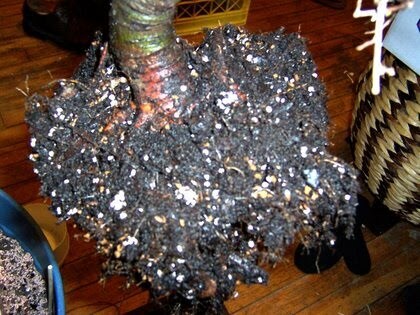 If most of your tree looks like this, it might be too late to repot, and you'll have to wait till next spring. Here is the tree before repotting. You can try out different pots by holding them infront of the tree and trying to visualize the two together. Here is the root ball. The tree isn't pot bound, but the roots have made it to the edge of the pot. 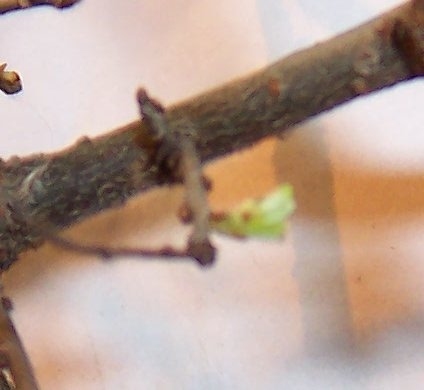 You can see the white filaments of root hairs. 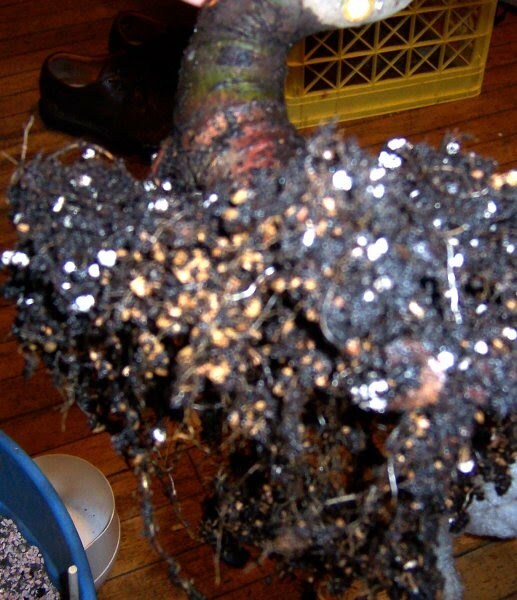 You can bare-root an elm, but I'm not going to this time, I'm just going to remove all of the soil that comes away easily. When the tree is more vigorous, I will get rid of the "potting mix" that you see here and replace it with bonsai soil. Here is a shot of the bottom. I left about 1.5-2 inches. 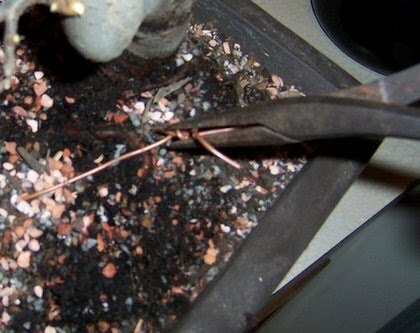 Wire is used to hold the roots in the pot. On a windy day, your tree can come out of the pot, and die in a matter of hours if you skip this step. Believe me, I know, I used to skip this step. 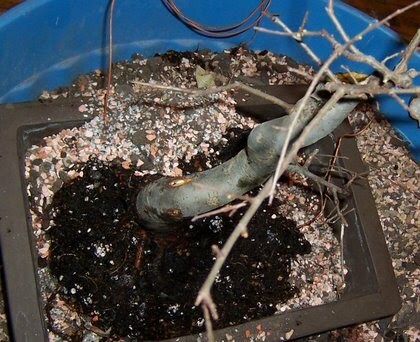 With the wire, the whole tree and pot will fall over, saving the tree. Also, some sort of screen is put over the holes and held in place by the wire. This keeps the soil from being washed away by the constant watering. Window screen works ok. This is pet screen, which has larger holes and is heavy duty. The best is cross stitch plastic from the sewing section. 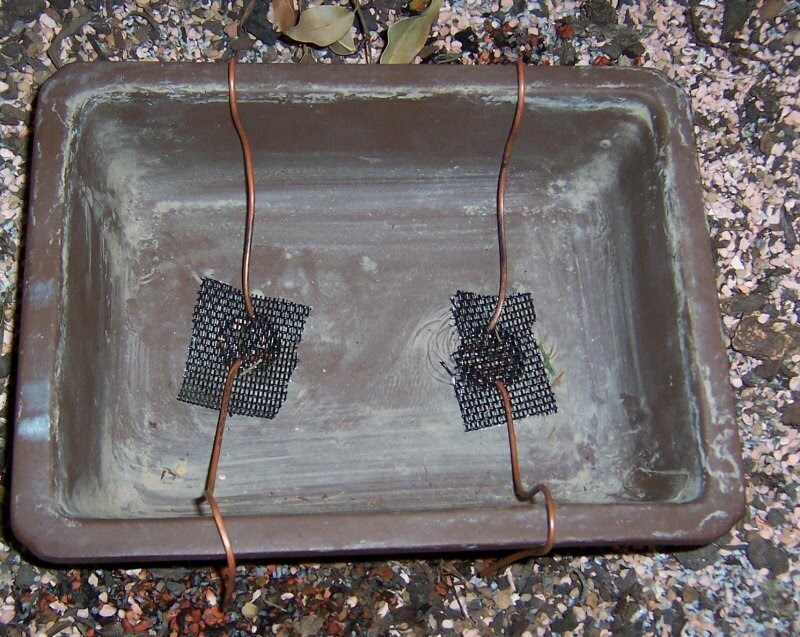 Here are two alternate ways to wire up the pot. Two wires. Both go in one hole and out the other. They are usually connected diagonally. One wire. This is the method I will use. 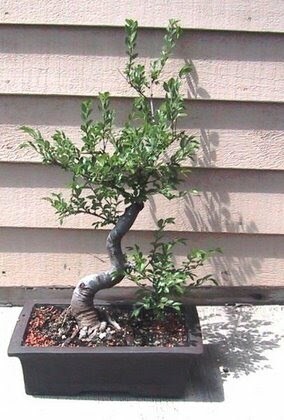 After much research, I've settled on a very simple bonsai soil mix. Equal parts fired clay, chicken grit, and pine bark mulch, finely ground. I sometimes add a small amount of peat moss to hold more moisture and provide more organic material. Tropicals like organic material. 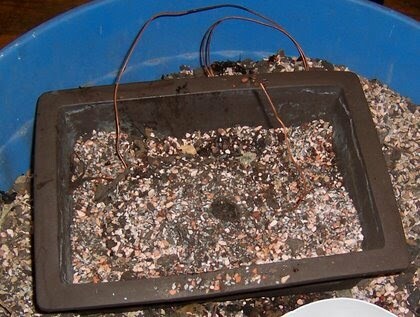 Don't try using potting soil or potting mix by itself. It is far to dense and holds to much water. 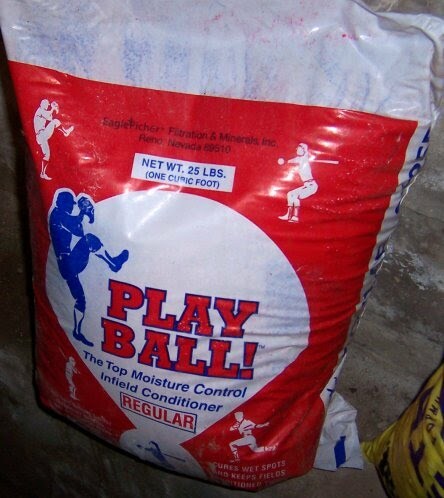 This stuff is used on baseball fields to condition the infield. The main brand is called Turface. Agway closed, and I couldn't get turface, so after searching for a year, a friend found Play Ball. In the UK, there is a particular brand of cat litter that they use. If you are going to try cat litter, be sure to test it. Most will turn to mush very quickly. 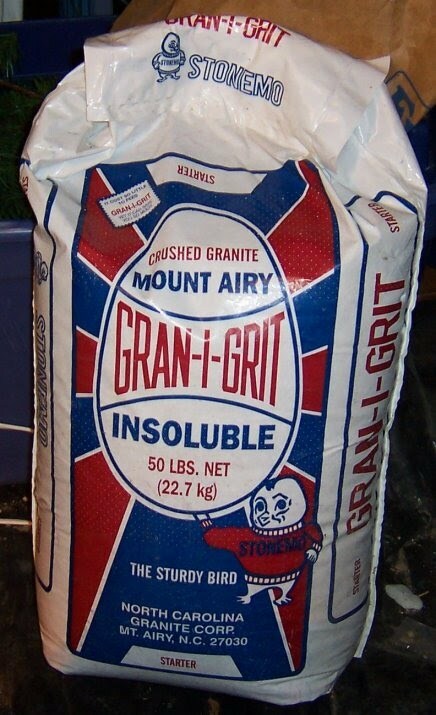 Go to your local feed store and buy some crushed granite, AKA chicken grit. You'll have to look at the particle sizes and use your judgment to pick the right size. I've gotten this at home depot. 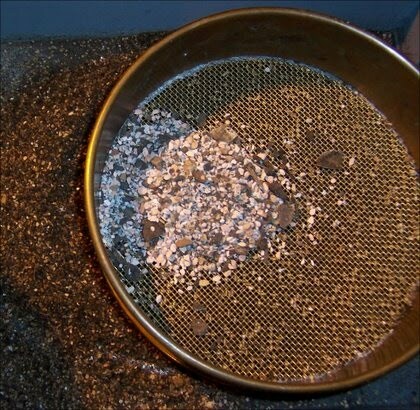 You'll have to screen out the larger particles if you don't find the right grade. If you have a chipper/shredder that will be perfect for making bonsai pine bark mulch. 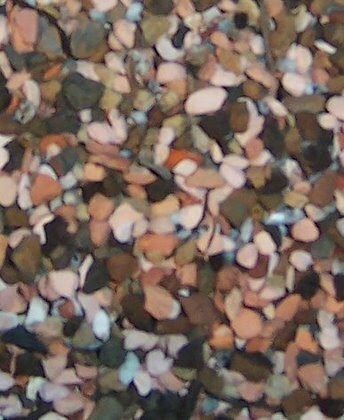 In this picture, you can see all three mixed together. The white is chicken grit, the orange is fired clay, and the brown is pine bark. Ideally, bonsai soil should be a uniform particle size between 1/16" and 1/4" because this will retain moisture, but drain quickly and freely. 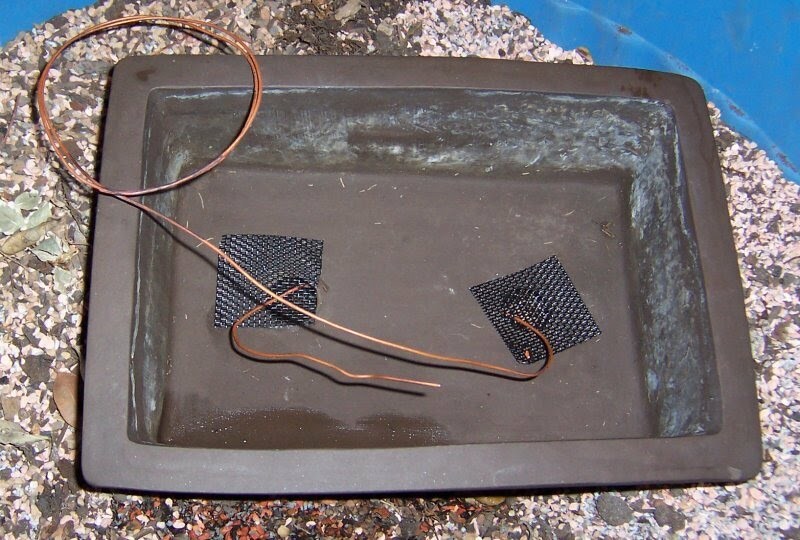 You don't want anything in your soil over about 1/2" If I'm worried about it, I will use a large screen (1/4" chicken wire) to screen out the large particles. Then I use the screen below to remove the fine particles. 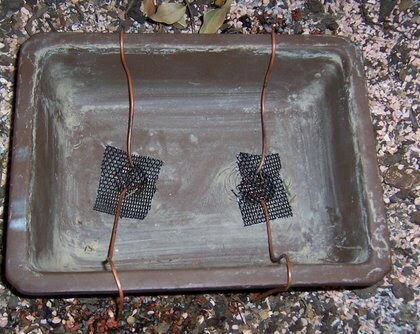 A wooden square with window screen (or pet screen) stapled to it works great. In the picture, you can see the fines on the left. These will clog up your soil, reducing drainage, increasing water retention, and clog up your screens and drain holes. Over time, organic matter breaks down to smaller particles. In a few years your pine bark will look like this. If you reuse soil, you have to dry it and screen it. 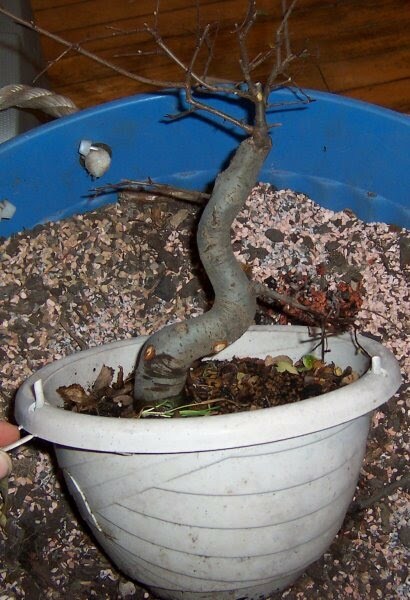 Put 1 inch of soil in the pot, and make a mound where the tree will be. Push the tree down on to the mound. Position the tree in the pot. 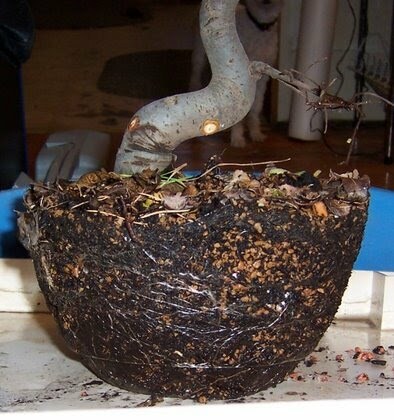 Try not to put the tree dead center in the pot. Put it off to one side, and always leaning toward the front. 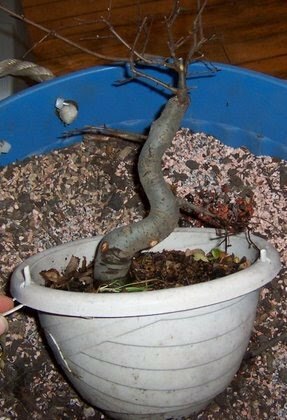 Here I want the tree to lean more forward, so I hold the tree forward and work soil down the back of the roots to prop up that area. Work the soil in with a chop stick. When the tree is positioned, twist the wires together. Pull toward you as you twist. Tighten until just before the wire breaks. Clip off the excess, and push the end down in to the soil. 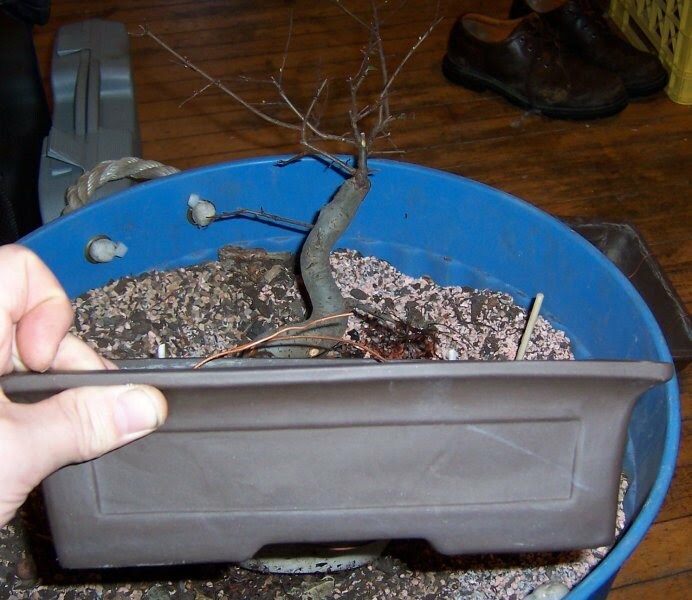 Fill in the rest of the way with soil, up to about 1/4"-1/2" below the rim of the pot. This will make it much easier to water, without worrying about washing away the soil. And here it is. 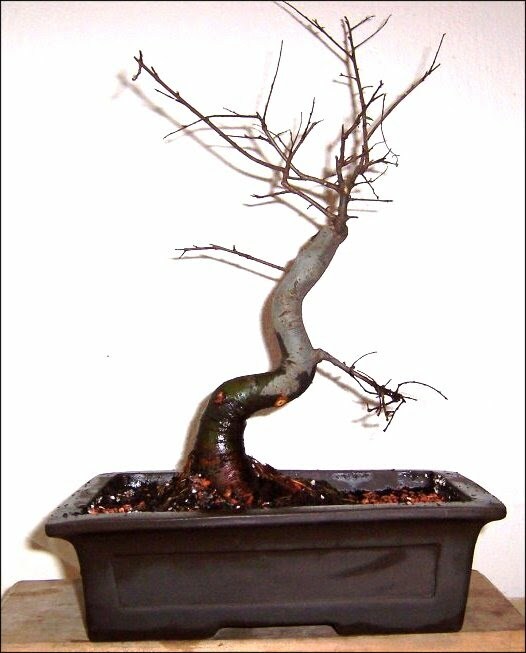 Below are some photos after the tree has leafed out. 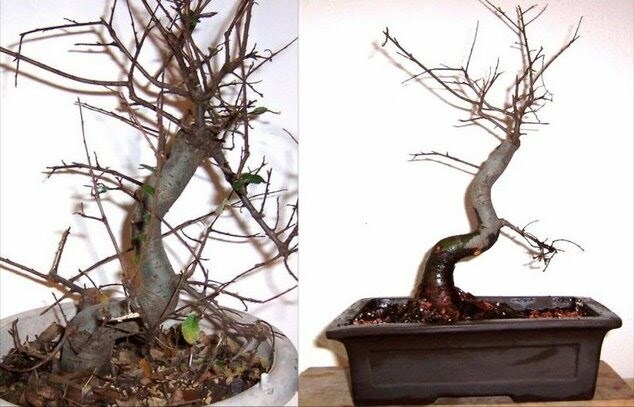 Spring is here, and I've taken some pictures of the tree before and after its first "haircut." 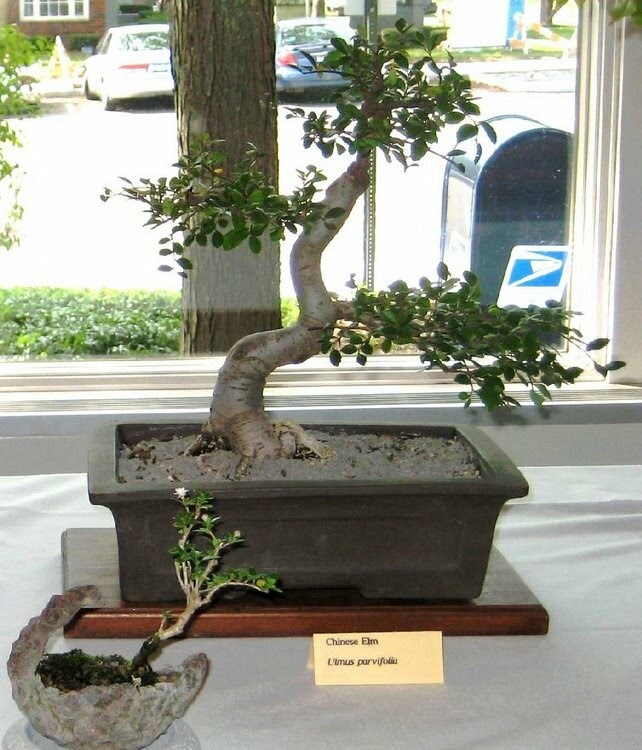 Next I have to develop fine branching and foliage pads. And here it is in it's first show. The foliage pads and top still need work. A back branch would add some depth as well.